Also why is the NC Fireman's Union forcing fireman to pay into something some may not even want to belong to? and the constitutionality of disbursements of portions of the premium tax on fire and lightning insurance policies. Is it constitutional for a portion of a premium tax to be disbursed to the State Firemen's Association, a private, nonprofit corporation? Is it constitutional to require that a fire department or its members be a member or members of the State Firemen's Association, a private, nonprofit corporation, in order to receive any portion of a premium tax? It is our conclusion that the appropriate answer to each of these questions is "yes." The North Carolina State Firemen's Association (hereinafter Association) was created by Chapter 251, Private Laws of 1889. In Section 1 of that Chapter, the General Assembly declared the Association to constitute a "body politic and corporate." The purposes for which said association is organized are: the protection and promotion of the best interests of the firemen of North Carolina, the compilation of fire statistics, the collection of information concerning the practical workings of different systems of organization, the examination of and inquiry concerning the merits of the different kinds of apparatus in use and the improvements in the same, the cultivation of a fraternal fellowship between the different companies of the State. N.C. 436, 438 (1949), the Court noted that the Association was created for statistical research and fraternal purposes "without appropriation." Two years after the Association was created the General Assembly, by Chapter 468, Public Laws of 1891, appropriated the sum of $2,500 annually to constitute a "firemen's relief fund." The source of the appropriation was the license taxes levied and collected by the State from insurance companies. The Treasurer of the State was required to pay the appropriation to the treasurer of the Association. The funds were to be used "for the relief of firemen, members of the association, who might be injured or rendered sick by disease contracted in the active discharge of duty as firemen, and for the relief of widows, children or dependent mothers of firemen killed or dying from disease contracted in discharge of duty." 230 N.C. at 438. In 1907 the General Assembly enacted legislation requiring insurance companies to pay a tax of fifty cents on each one hundred dollars of premiums written on fire and lightning policies covering property situated within the limits of qualifying cities and towns in North Carolina. The taxes were to be used as a firemen's relief fund and were to be collected by the Commissioner of Insurance, who was directed to pay the taxes to the treasurer of each qualifying town or city, subject to the use of the board of trustees of the firemen's relief fund in each town or city. The act also provided that a sum not exceeding five per cent (5%) of the gross proceeds was to be turned over to the Association. N.C.G.S. § 58-84-10 is deducted from the total and paid to the treasurer of the Association "for general purposes." N.C.G.S. § 58-84-25. The original percentage (5%) was reduced to three percent (3%) in 1986. For the fiscal year 1994-1995, this amount was $74,419. The Association, however, does not retain this entire amount. Pursuant to N.C.G.S. 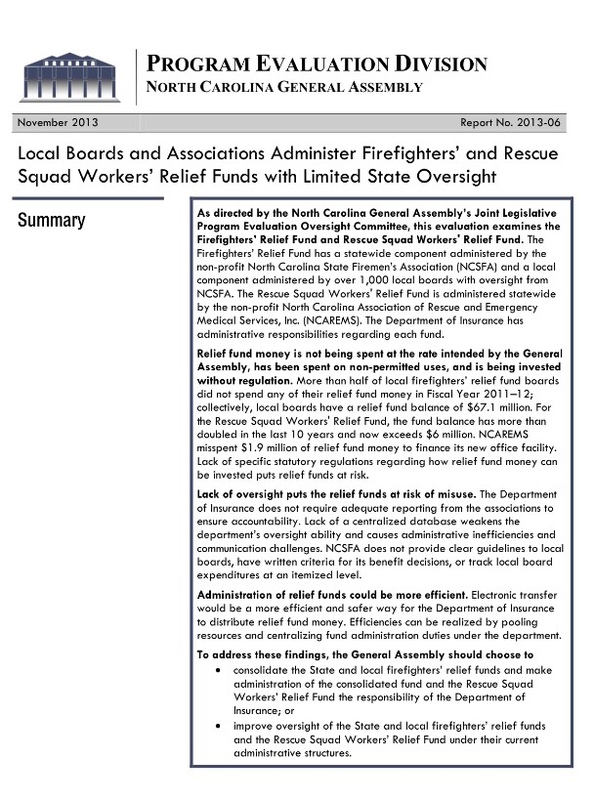 § 58-85-30, the treasurer of the Association is required to pay to the treasurer of the North Carolina State Volunteer Firemen's Association one sixth of the funds generated by the three percent (3%), "to be used by said North Carolina State Volunteer Firemen's Association for the purposes set forth in G.S. 58-84-35." The second source of funds for the Association is forfeited funds known as "disqualified accounts." After retaining two percent (2%) of the total in the budget of the Department of Insurance for administrative purposes, the Commissioner of Insurance pays ninety-five percent (95%) of the money collected from insurance companies to the treasurer of each qualifying town or city in North Carolina, who in turn pays the money to the treasurer of the local board of trustees for the use of the board of the firemen's's local relief fund in each qualifying town or city. N.C.G.S. § 58-84-25. Pursuant to N.C.G.S. § 58-84-50, however, if the fire department of any "city, town or village" fails to comply with the constitution and bylaws of the Association, the "city, town or village" forfeits its right to the "next annual payment due from the funds mentioned in this Article, and the Commissioner of Insurance shall pay over said amount to the treasurer of the North Carolina State Firemen's Association and same shall constitute a part of the firemen's relief fund." For the fiscal year 1994-1995, this amount was $129,678. It should be noted that the tax on fire and lightning insurance premiums imposed by N.C.G.S. § 58-84-10 is different from the additional gross premiums tax imposed by N.C.G.S.§ 105228.5(d). The latter statute provides in pertinent part that "[a]n additional tax shall be applied to amounts collected on contracts of insurance applicable to fire and lightning coverage, except in the case of marine and automobile policies, at the rate of one and thirty-three hundredths percent (1.33%); twenty-five percent (25%) of the net proceeds of this additional tax shall be deposited in the Rural Volunteer Fire Department Fund established in Articles 84 through 88 of Chapter 58 of the General Statutes." Article V, § 2(1) of the North Carolina Constitution provides that "[t]he power of taxation shall be exercised in a just and equitable manner, for public purposes only." The General Assembly may enact laws whereby the State, any county, city or town, and any other public corporation may contract with and appropriate money to any person, association, or corporation for the accomplishment of public purposes only. N.C. Const. art. V, § 2(7). "nder subsection (7) direct disbursement of public funds to private entities is a constitutionally permissible means of accomplishing a public purpose provided there is statutory authority to make such appropriation." Hughey v. Cloninger, 297 N.C. 86, 95 (1979). Therefore, whether the Association is a public or private entity matters not. So long as the Association serves a public purpose, which it clearly does, the Association may receive public funds. One need only to read Section 2 of Chapter 251 of the Private Laws of 1889 to see that the purposes of the Association are public--to better organize and train the firemen of North Carolina. Moreover, we believe that the Association is in fact a public body. Although the Association was created by a private act of the legislature, it was declared to constitute a "body politic and corporate." In Student Bar Association v. Byrd, 293 N.C. 594, 601 (1977), the Supreme Court of North Carolina defined the term "body politic" as "a body acting as a government; i.e., exercising powers which pertain exclusively to a government, as distinguished from those possessed also by a private individual or a private association." It seems clear that the Association is acting as a body that exercises governmental powers. Pursuant to Article 84 of Chapter 58, certain duties and responsibilities are placed upon the Association. For example, the Secretary of the Association must approve the decision of a local board of trustees to provide assistance to a "destitute member fireman who has served honorably for at least five years." N.C.G.S. § 58-84-35(2.l). Similarly, the board of trustees is prohibited from making expenditures under subsection (5) and (6) of N.C.G.S. § 58-84-35 "unless the State Firemen's Association has certified that such expenditures will not render the Fund actuarially unsound for the purposes of providing the benefits set forth in subsections (1), (2), and (4) of this section." See also, N.C.G.S. §§ 58-84-40(a) and 58-84-50, which grant additional governmental powers to the Association. It is also our conclusion that it is not unconstitutional to require that a fire department or its members be a member or members of the Association in order to receive a portion of the tax. The first sentence of N.C.G.S. § 58-84-50 provides as follows: "For the purpose of supervision and as a guaranty that provisions of this Article shall be honestly administered in a businesslike manner, it is provided that every department enjoying the benefits of this law shall be a member of the North Carolina State Firemen's Association and comply with its constitution and bylaws." This requirement was included in the original version of the statute, which was enacted in 1907. N.C.G.S. § 58-85-25 states that "[t]he provisions of G.S. 58-85-1, 58-85-10, 58-85-15, 58-85-20, and 58-85-25 shall apply to any fireman who is a member of a regularly organized fire company, and is a member in good standing of the North Carolina State Firemen's Association." The General Assembly has full legislative powers "unless restrained by express constitutional provision or necessary implication therefrom." Martin v. Housing Corp., 277 N.C. 29, 41 (1970). Absent constitutional restraint, questions as to public policy are for legislative determination. We cannot conclude that any constitutional provision is violated by the requirement that fire departments and firemen must be members of the Association in order to enjoy the pertinent benefits. Once the public purpose of an act has been established, the means of executing the project are for the General Assembly solely to determine. Redevelopment Commission v. Bank, 252 N.C. 595 (1960). Having concluded that the appropriation of tax revenue to the Association is for a public purpose, we also conclude that it is not unconstitutional to require that a fire department or its members be a member or members of the Association in order to benefit from the tax revenue.